Story: Ever since i saw it about 5 years ago, i've waited for the day i'd finally steal a Ruined Painting (from a player, not a chest). I refused to buy one, i wanted to steal it. Anytime i'd come across one, it'd get away from me before i could get my hands on it. This was the item i've wanted to steal most for the past 5 years. A few weeks ago, i came across Xyn in Luna. We talked, and he brought me to his large tower. He had a ruined painting. Plans started flying through my head on how to eventually steal it. I figured, considering he never leaves tram, i'd join his guild to steal it...it was really the only way. Fast forward to this afternoon when i see his guildmate, Korlic, in Luna with the same title as Xyn..."Rare Collector". So, unfortunately i reach for my disguise kit. I change my name to Frazer, dye my hair, and give myself a little makeover. I then toss on the Shroud of Tal'keesh to look flashy. 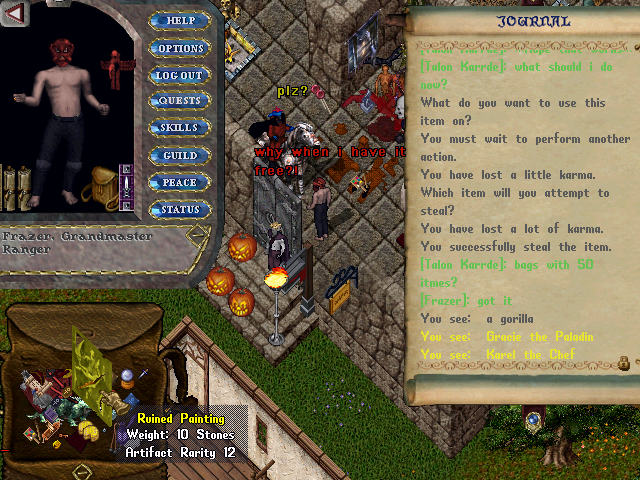 I speak to Korlic, and ask him to join their guild. The GM of the guild shows up and speaks to me a while. He eventually puts me in the guild with the title "Rare Collector". Seeing as though Xyn is no longer online, i log off and head to work. I get off of work and get back on around 11pm. Xyn still isn't online. I check on a few things, then decide to log. As i'm going to log out, i see he has just logged on. I quickly head to Luna and find him. I get some help from a friend to coax him into selling it. After some confusion with how to get to his house without him noticing, i make it there undetected. There i am, inside his house with him, as my friend leaves through the gate to go get the checks ready for the deal. Alone (so he thinks), Xyn heads for a chest in his tower. The painting appears in his pack, uninsured. I run outside of his tower and hide. I then say in guild chat "Sorry, it's my job." I leave the guild and walk back to have a convo with the poor guy. 5 years from when i first saw it, it finally hangs in my house.